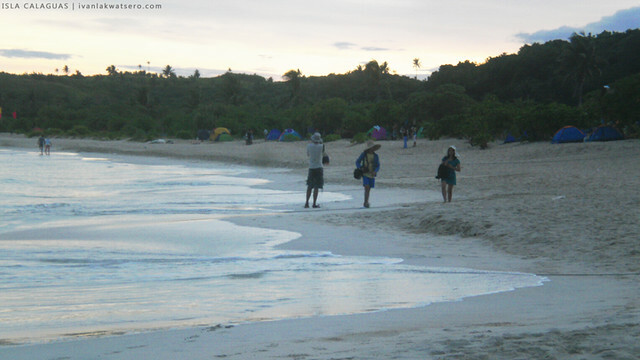 At 11:30 before noon, we landed on the much sought-after beach of Camarines Norte. 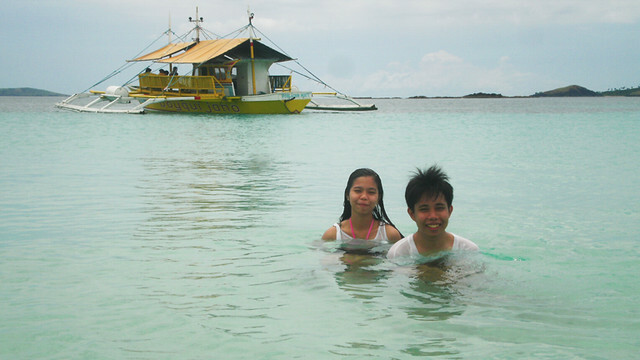 Sun's heat was at its height so we rushed towards the shade of the trees along the beach. My feet fell in love at first step, the sand was indeed powdery and white. 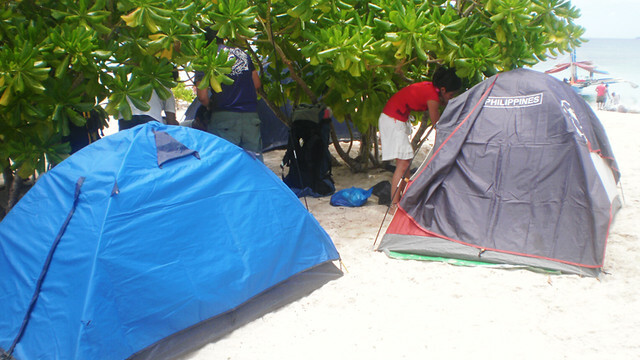 I looked around, the beach was pleasing, very pleasing (minus the red tents, of course). tatalon na ako! excited na bumaba. 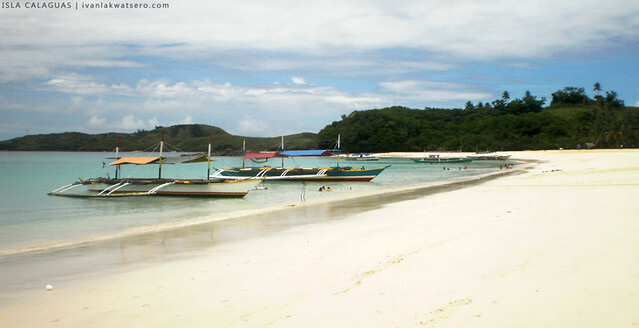 buti na lang maganda pa rin ang Calaguas kahit may mga eye-sores na. the sand was just too good. mapapansin din ang strap ng aking sandals, bakat na bakat. nog nog! The beach was so inviting, ligong-ligo na kami lahat, but it was lunchtime already and our tummies we're screaming loud. 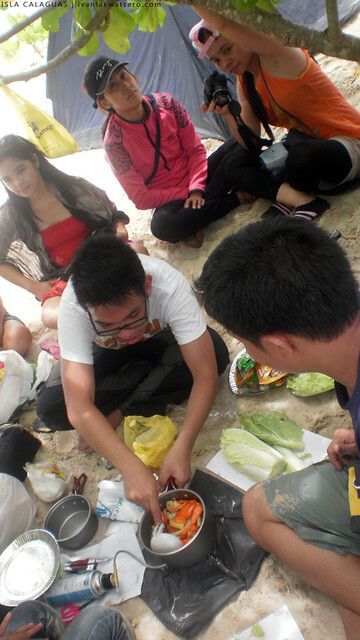 So we hurriedly raised up our camp, and cooked our lunch. our lunch (c/o master chef Jonas). 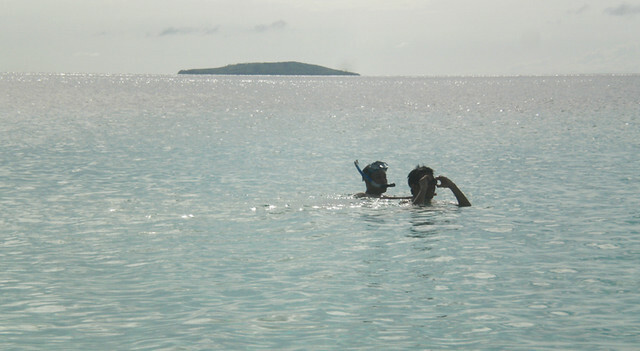 My college buddies can no longer resist the tempting clear shallow sea, they soon plunged and bathed like there's no tomorrow. 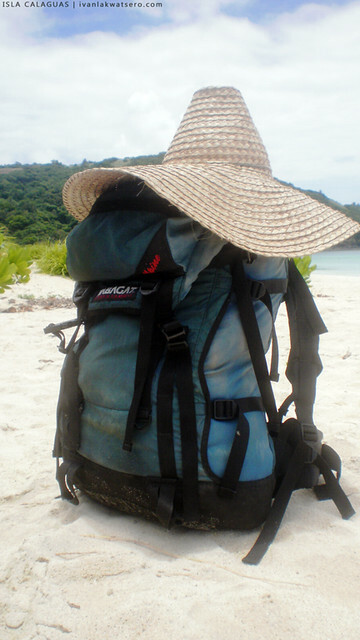 The sun was still striking badly at that time, but who cares, you simply cannot call a summer trip a summer trip if you do not acquire any tan-lines. Kevin and friends, they enjoyed playing with the sand at kung anu-ano ang binubuo..
kaya naman malayang malaya ako makapag-photo-ops ng solo. woohoo! Sunset came too fast, which means we need to prepare our dinner soon. 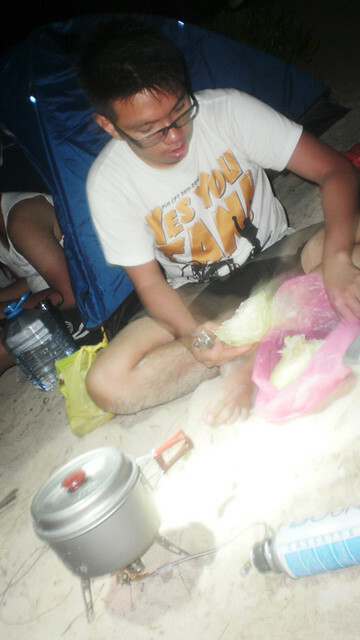 There's no electricity on the island so we have to prepare it fast with the aid of our headlamps as a source of light. 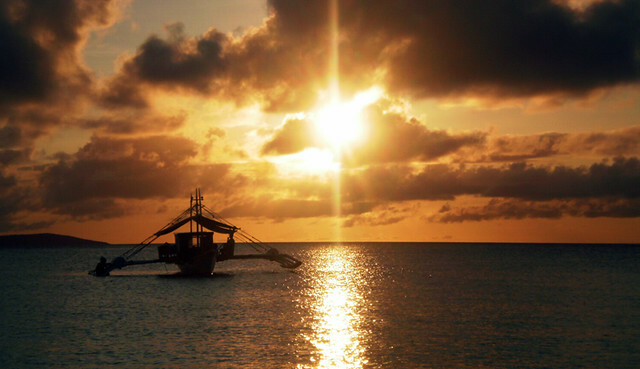 fail sunset viewing, bigla kasi nagtago sa likod ng clouds yung sun, kaya hndi namin nakita yung buong bilog na sun. At around 9PM, we noticed that numerous stars were glittering in the sky, a perfect opportunity to do star gazing. We laid down on the sand and waited and waited and waited until I saw a shooting star. 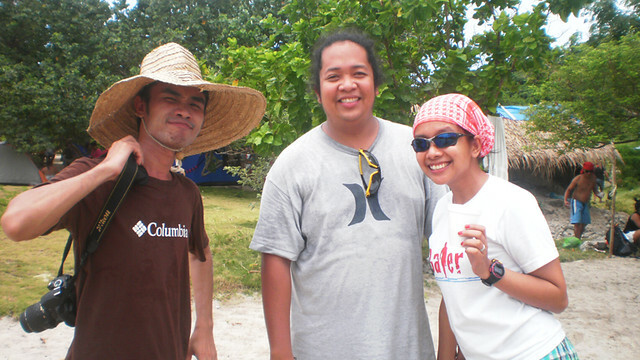 Then I can't remember what happened next, kasi I soon fell asleep on the beach. The next thing I could remember was that Kevin was waking me up because it was drizzling, it think it was 12 midnight. Before I entered the tent, I noticed that the party was still not over (oh well mabel...), I don't wanna ruin my vacation because of them so I just ignored them and took my needed sleep. I woke up at 05:30 AM, just right in time for the sunrise. I invited everyone to join me hike the nearby hill, which I think is a very good vantage point to view the sunrise. Only three showed interest to my idea, others were still sleepy I guess. 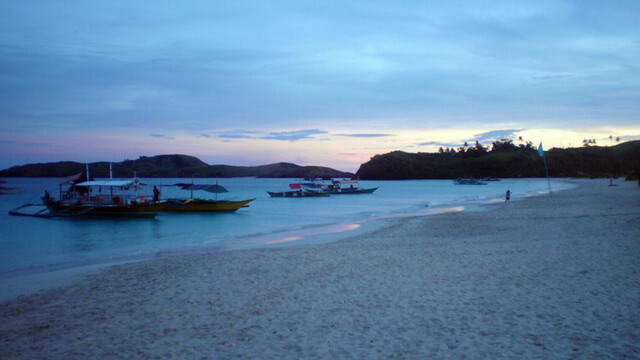 5:30 in the morning.. daybreak at Isla Calaguas. Chino, Elal and Kevin said they want to join me in my "mini hike" up on the nearby hill. But they were walking really slow. I told them to hurry up because the sun is almost up but they're still maintaining their very low speed. Aww, it was a weekend when you went right? Ganun ata talaga lalo na pag summer. 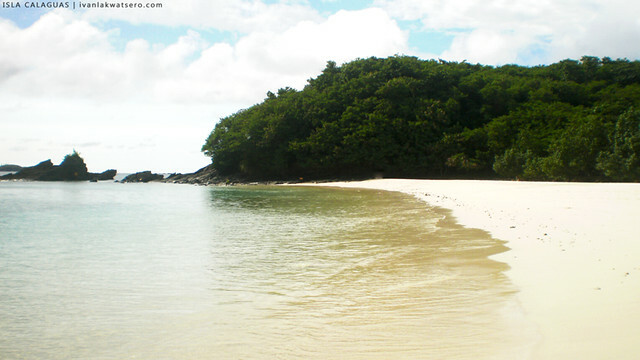 Hopefully next summer makapunta nako ng Calaguas. And will make sure slightly off peak. Hihi. hmm. 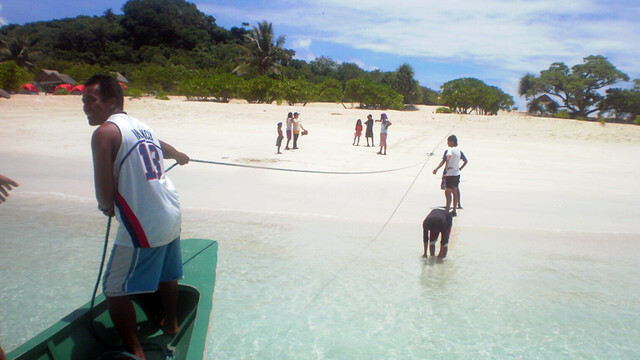 yung punta namin slightly off peak, pero marami pa rin tao... mukhang mahirap na tlga mawalan ng tao sa Calaguas.. sikat na kasi e. tapos yung iba, nagpapaparty pa.. sigh. ahahahahaha, bigla syaang nag disappear sa batuhan. 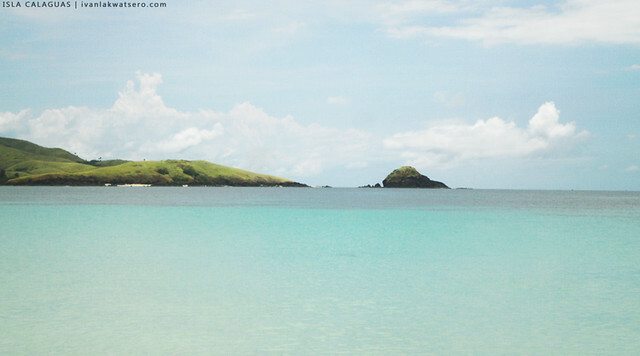 Because of what you and the other bloggers shared, I'll make sure to visit Calaguas on a weekday. Hahaha. sarap ng calaguas at parang masarap din ang nilagang baboy with buhangin. ehehehhe..salamat sa heads-up. pareho tayo ng expectations. kaya nga gusto kong pumunta dyan.